Champions in Action rescheduled for November 27th, 2009. Elephant man is no longer on the bill. 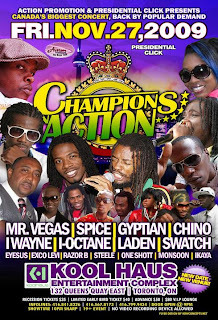 Champions in Action features Mr. Vegas, Spice, Gyptian, Chino, Laden and more.